This model is my entry for the TC12 Eurobricks contest. I updated the photo sequence instructions with pdf-computer-image instructions made by Ivan_M from Eurobricks. Thank you very much Ivan Moc for putting in the effort to make these very nice instructions! - Cabin tilts in turns, which compensates for the centrifugal force the driver is exposed to. The idea boils down to a cabin that is connected to the front and rear axles with turn tables. The turn tables are inclined, which results in the following effect: steering the front axles makes the cabin tilt, which in turn makes the rear axles steer. The front axles are inclined more than the rear axles to make sure the rear axles don't steer as sharp as the front axles.To obtain straight line stability the front and rear segments are stablized with silicon bands. All inclined constructs rely on perfect fits derived from the Pythagorean triple (3, 4, 5). 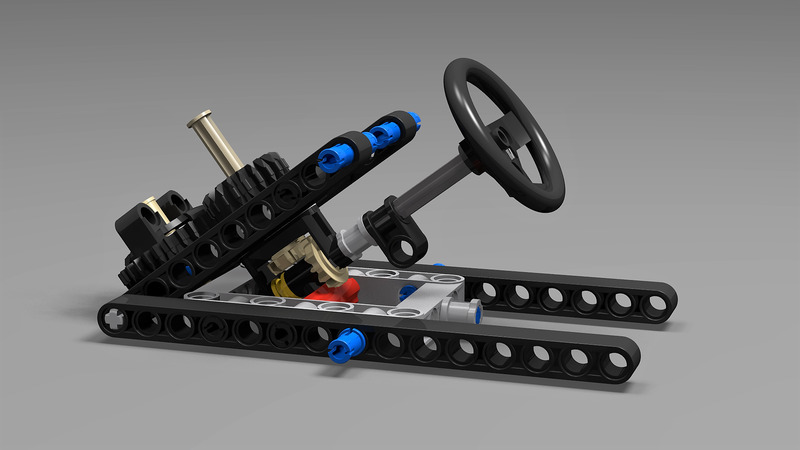 To make sure the return to center for the steering setup is working properly, it is important to align the axles involved correctly: When the front axle is straight, the axle with the 20t gear should have a 45 degree orientation and the axle with the steering wheel attached should have a 90 degree orientation. See this discussion topic to see how this model evolved. A big thank you to everybody involved in that topic!